The menu items each have a selection choice of side dishes and pies. How do I create this type of order form so that i can limit the amount of choices? If you want a custom developed form that you're not capable of making yourself, try paying a web developer to do it for you. JotForm is "do-it-yourself". This forum is for people with legitimate issues with the form builder itself - NOT for people wanting specific form customization. Thanks so much for your quick response! That helped immensely! As for a legitimate issue, I decided to use the "Purchase Order" and added the products I wanted, however, when testing it out, the email that I submit to myself does not have any of the ordering information I filled out! Is there something I am missing? Perhaps a field I need to adjust the settings to so that I may see the order that is placed? It is perfectly possible to have quantities on your products and limit the numbers on them. 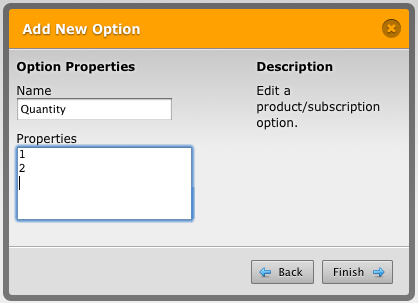 If you only leave "1" and "2" in the options, the user will not be able request that particular product or side entry more than 2. If the order details are missing on the email, you might need to reset the email, or add the field to the email manually. To reset email, click on "Email Alerts" button, select "Notification Email", and then click on "Delete Email". Then re-click on "Email Alerts" and then "Add New Email", then select the Notification Email and complete the wizard. Then save your form. A quick question to add on, what if I want to integrate a payment field in this particular widget? I like how the form turned out and just didn't want to start over. I've moved your question to a new thread: http://www.jotform.com/answers/458781 so it can be addressed properly. Please refer to this new thread for any updates.